English actress Charley Webb did a different take of the top bun, by sporting an intricate braided variation of it at the 2013 British Soap Awards. What we like is the intricacy of the hairstyle because it combines fishtail plait with a normal braid – to give a unique twist to the top bun. It is a style that can be easily sported to a variety of occasions and will surely turn heads, which is reason enough to tell you the steps to do the hairstyle yourself. Make 5 sections of your hair by parting it front to back. The middle section should be the widest and extend from right above the arch of the left eyebrow to the arch of the right eyebrow. Secure this section in a ponytail with the help of a hair elastic. Now make 2 sections each on either side of the middle section. With each of the 4 sections make a fishtail plait that extends from where the hairline starts to where the scalp ends. Once all the 4 sections reach till the back of your hair, pull them up to join the middle section that is tied in a ponytail – and tie together with a hair elastic. Make a braid with this ponytail. Next, make a top bun with the braid and you are ready! 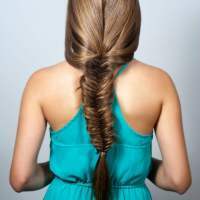 You can also try the easier variant of this hairstyle by skipping the fishtail plaits on the side.